It's already been a busy week with Syrenka Series happenings and it's only going to speed up! First, two four-star reviews of Promises were posted this week. Tess at My Pathway To Books had some really nice things to say and supported an awesome giveaway that I hope you were able to enter. And Jammie at The Confessions of a Book Nerd spread the word around Australia about how excited she is to read the rest of the series! Yeah! Way to make my day ladies! Then, I visited our local independent book store to see if they were willing to sell all three books, and I was pleasantly surprised to see Promises front in center at the first display as I walked in the door! They are doing a mermaid promotion so I think my timing couldn't have been more serendipitous. 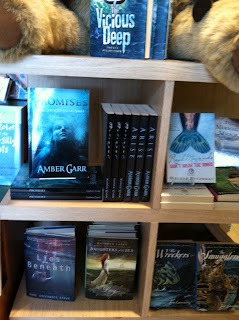 Here is The Syrenka Series standing next to so many other great books!! Wahoo! And coming up in the next few days is the series tour at Bewitching Book Tours Tours and in August, each book will be on a three week tour with Bookshelf Confessions. There will be lot's of reviews, interviews, guest posts, and giveaways so be sure to check it out. I will post the schedules soon! Just downloaded my copy of Promises onto my Kindle, can't wait to get stuck in!